When my friend told me she has experimented baking a Milo version of the Horlicks Doggies Cookies, I was real curious to know how the Milo ones would taste like. Taste wise, the Milo cookies are equally crunchy as the horlicks version, in fact, I find them richer in taste. My boys were very eager to try them as I've used the new Koko Krunch duo for the ears. This new range of Koko Krunch has got both dark chocolate (the usual ones) and white chocolate flavours in a pack. However, the effect was not very good for those doggies with white ears...they looked rather strange, don't you think so? they are all so adorable! Why they don't see the koko crunch in the US?! Actually I like the ones with white ears. They look so unusual! I've been meaning to make these cookies but we don't have Horlicks, here. Patricia, what about Milo, can you get it over there? Oh yes, Ovaltine, its taste is almost similar to Milo. I can't wait to see your ovaltine doggies cookies!! Oh tks so much!!! I hv no cake mixer for now (shopping around but not sure what to buy coz I am uncertain abt buying an expensive one if my "passion" fades and if I buy a cheaper one, it may not work properly! ), am registered for a couple of classes but not started yet, "studying" alot of baking theory on website to prepare myself (tks for the muffin website..it'll be very very helpful) so I can only bake stuffs that require no machinery (luckily I love muffins! Those sold tend to be abit too sweet for me)...u cannot imagine how happy I was when I saw yr durian (my all time love) and muffin and no machinery combination!!!!!!! Tks tks tks!!!! oh i c... so it's 2IN1...two flavour in one pack.. ok ok.. i shall go take a look again later today.. :) Thanks alot for your infor. Hi Ellena, you can take a look at the picture posted by this blogger here. I got it from Sheng Shiong supermart. THanks... i saw the adv on TODAY newsapaper.. hahaha.. thanks..
love to try this cookie, horlick doggie crunch but how does the koko crunch looks like? I meant the bag so i can go looking for it in Canada as well. Cheers again for all the lovely goodies in your website. I am enjoying your blogs! it impressed me a lot :) Your so talented! Thanks alot for sharing recipes!!! Your recipes are awessome! I was thinking we could try coffee too? Then we have mocha doggies..! Just a question, will it be alright to substitute the 25g milk powder with milk.. cuz this country doesn't sell milk less than 500 g! Hi Shannon, I think you can try replacing the 25g of milk powder with equal amount of flour or coffee powder, or cocoa powder but not milk in liquid form. Awesome.. thanks for your reply! I went ahead to buy a kilo of milk powder after all (skimmed milk though). I tried baking them today with ovaltine and they were awesome and cute! Everyone said it was bitter.. I replaced 2 tbsp of flour with corn flour cuz I didn't have cake flour.. hmm.. Apparently all my friends said it tasted bitter... wonder what went wrong? I placed more than 3 choc chips in them. And comments? Hi!! 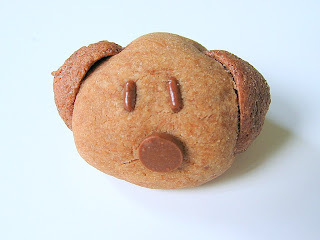 Your milo/holicks doggie cookies are soooo cute! Was wondering if I could use fresh milk to replace the 25g milk powder or is using Anlene possible? Hi, for the milo version, I have added in the milk powder as well. Delicious! I will try these this weekend! Hi Levynn, self-raising flour has got baking powder in it. However, this recipe doesnt requires the use of baking powder. As such I won't recommend that you use it. I was bored one day and decided to bake MILO cookies (b4 I chanced upon ur blog for the proper recipe!). baked it at 170 Deg C for 15mins..cookies turned out good but they were rock hard! why is that so?? made this for my bf on mon. anw thanks for the great recipe...the cookies taste great!!! I'm so bummed that we don't have Koko Crunch or anything that even has the same shape as Koko Crunch here in the US. I must find some substitute for the ears! HI..the Milo powder you use normal tin type or thos 3 in 1? Hi Anonymous, I use the normal type of Milo powder, not those 3- in-1. I think the doggies with white ears look really cute! i will try making these milo cookies as i dont have any horlicks. Hi! 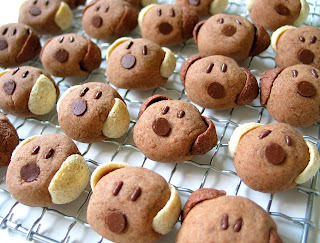 My friend and I are thinking of baking this milo doggies (to make our friends go wow hahaha) for a picnic and we were wondering if we could replace the milk powder with milo powder just like replacing it with horlicks for the other recipe? Hi, although I have not tried omitting the milk powder, I think you can give it a try by replacing it with the milo powder. I hope it will not affect the texture too much, happy baking! is it alright if i use plain flour? would there be any much difference? Hi yingxuan29, I am sorry I have not tried using plain flour. If you don't have cake flour, you can substitute it with a mixture of corn flour and plain flour. 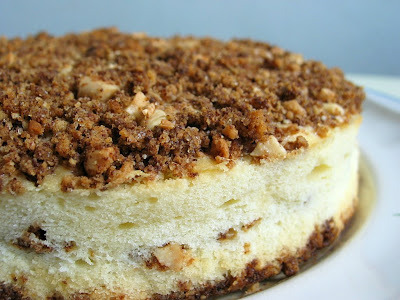 You can refer to the website: joyofbaking.com for the substitution. Can I check with you for this milo cookies, how come mine is so soft? My dough was soft before I bake them. I bake a tray of 24 pc at 150 degree for 30 mins. Do you know where did I go wrong? I am not sure what went wrong, the dough is suppose to be soft, but upon it should be cookie-like, not soft. I think you may have under-bake it. Is your oven temperature correct? Did you preheat your oven. I need to use an oven theremometer as my oven temperature is not stable. After placing the cake inside the oven, the temperature will drop by 20degC! As all oven works differently, you may need to test out to get a feel of how your oven works. Simple and easy & very delicious!! I think I am in love...with the cookie :) Thks for sharing such a lovely recipe, I had tried your recipe and it turned out quite well. I am not able to find the recipe. Can tell me where can I get the recipe? 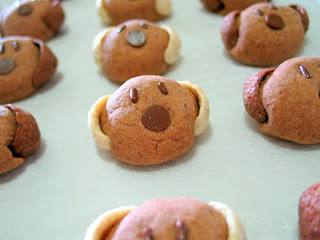 Hi, you can click on the words "Horlicks Doggies Cookies", 2nd line of this post and it will bring you to the recipe. Happy baking! Hmm This is my 1st time try to bake..it seem not really successful. I do not know why it does not become a dough. Can u help me? and also the chips is it suppose to melt in the cookie while baking and where the sweetness come from? Since you didn't mention how you went about making it, I am not able to give any comments. Did you measure the flour amount correctly? Yes, the chcocolate chips will melt after baking and give the cookies the sweetness. I finally have the cookie bake. I think my mistake is is not putting water. I did not know need to put water to form the dough. the cookie seem dry in the mouth..and cookie suppose to be softer in the insdie, right? So how am I going to make the cookie softer in the inside? Is it I should put more water? Hi, there is no need to use water to form the dough. Just beat the butter and the milo/horlicks powder till the mixture becomes fluffy, then add in the flour mixture, beat and gather to form a dough. hello. I have bake the cookies. however the taste very plain. no milo taste at all and it's not sweet. isit possible to add sugar? Hi, I am sorry to hear that the cookies didn't turn out as what you have expected. I am not too sure about adding sugar, but you can probably give it a try. Can i use coco powder for this cookies? Hi Judy, as there is no sugar used, the cookies will taste bitter if you use cocoa powder instead. and the ear + nose gone black when in oven..
Hi Anonymous, there is no sugar used in the recipe, that is why you feel that the cookies taste blend. You can try using 3-in-1 milo powder instead. 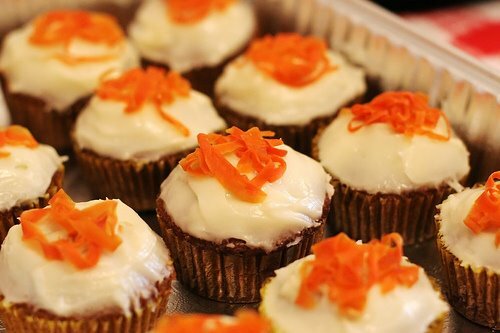 1stly, thx for sharing so many wonderful recipes on your blog. I happened to chance upon it yesterday and spent the whole night reading & choosing which recipes to try.. Anyway, I decided to bake these cute cookies with my children today and not sure if I've done it correctly.. Have to admit though that the cookies was rather tasteless (no milo & sweetness) like most commented. Do you melt the butter till liquid form? Cos my mixture (butter+milo) wasn't fluffy (more like watery). Also, is the dough dry & crumbly? Hi Jas, the butter is not in liquid form, did you melt/heat it into liquid form? You just need to bring it to room temperature (slightly soft and yet firm) and beat it with the horlicks/milo. The mixture shouldn't be watery. There is no sugar used in this recipe, so the cookies is not sweet. The dough should be soft and pliable. It is not dry. I'm so glad i chanced upon your site. These cookies r downright adorable. All those cookies in cookbooks & online r usu from the States and r horribly sweet. I cant wait to try baking your cookies for my girls. What is the difference between cake flour+ corn flour and all purpose or plain flour? Hi Anonymous, you can check this site joyofbaking.com or baking911.com for info on the various types of flour. These are the cutest cookies I've ever seen. They probably taste amazing too.